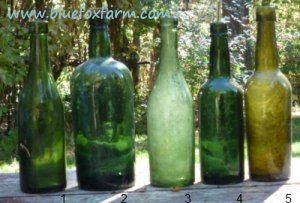 Keep your eyes open when you’re walking in the woods and fields around your home; antique glass bottles constantly re-emerge from leaves and grass around old homesteads and towns; in fact, anywhere that people have dumped their garbage. Luckily for us, what used to be trash a hundred years ago can be worth a lot of money. Some antique glass bottles have been valued in the thousands of dollars; not that all old glass is valuable, but antique bottle and glass collectors seek out antique glass bottles, antique glass insulators, antique glass lampshades and many other collectibles. Glass tends to get brittle with age, so much of these have fallen to Father Time, and over the years they have been shattered. The value of antique and vintage glass only increases with each year. 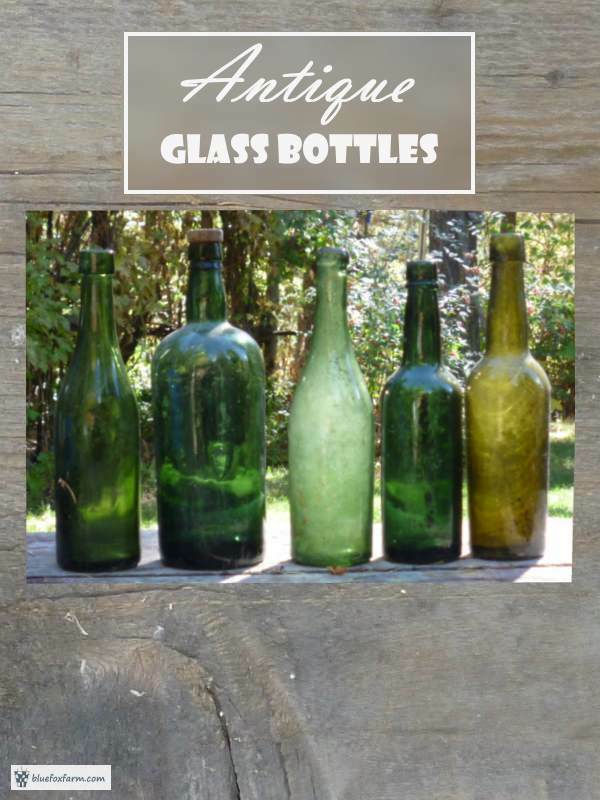 Antique glass bottles are more valuable if they have no cracks, chips or other damage; this doesn’t include ‘bulls eyes’, bubbles, inclusions or other imperfections during the manufacturing process. 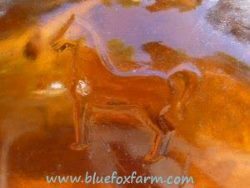 Collectors look for embossed glass, especially those with a logo or picture. Many vintage bottles have the name of the company or the product, and many are in distinctive shapes. There are several different techniques that were used to make bottles. Many exist that are hand blown, and therefore have interesting bubbles or marks, and being hand made, are all slightly different. Looking on the bottom of them, you can see the pontil mark, where the tube to blow through was attached. In some cases, the top of the bottle, the mouth was blown separately, and you can see the join. The method of blowing glass into a mold can be detected by the lines where the mold edges closed together. Poured into a mold, glass could be marked with numbers or other identifying marks. This is the most common type of antique glass bottles that you may find, especially in North America. Many show the embossed logo or company name, the amount the bottle holds or other important information. 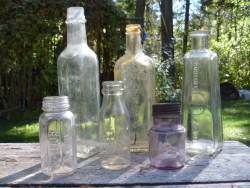 So, next time you’re in a thrift store, at a garage sale or simply hiking in the woods, keep an eye open for antique glass bottles – you may just get the vintage glass bug.